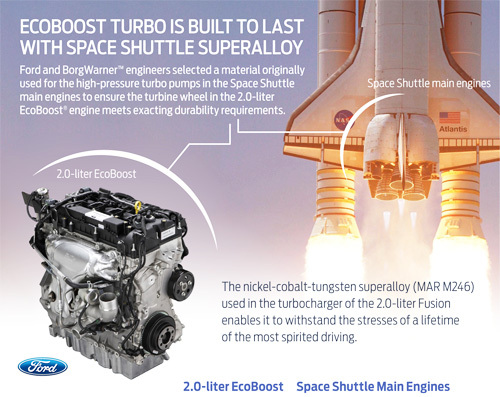 Ford is using a superalloy developed for use in Space Shuttle engines to extend the temperature limits of the turbochargers for the Ford Fusion and Focus ST EcoBoost engines. It may not be a rocket ship, but it has learned a thing or two from one. The fuel efficiency of Ford's EcoBoost engine comes from using the motor's exhaust flow to spin a turbine wheel at speeds up to 150,000 rpms, compressing air to create a more forceful explosion in the cylinder. The consequence is a component that functions at high temperatures and intense levels of physical stress. So Ford partnered up with BorgWarner to extend the functioning, durability and resistance to thermal fatigue of the turbochargers for 2.0-liter EcoBoost variants, selecting the materials offering the best long-term performance commercially available for the turbine wheel. The alloy selected for this purpose has withstood the temperature and reliability requirements of space flight. The superalloy was previously used for both the high-pressure fuel turbo pump as well as elements of the high-pressure oxidizer turbo pump on the Space Shuttle's main engine. The 2.0-liter EcoBoost engine in the Edge and Explorer models has a maximum heat limit of 970 degrees Celsius (that's 1,778 degrees Fahrenheit) for the turbine wheel. For the new 2.0-liter EcoBoost used in the Fusion and Focus ST, the combination of nickel, tungsten and cobalt developed by rocket science creates a maximum heat ceiling of 1,050 degrees Celsius or 1,922 degrees Fahrenheit. Who knew these impressive little cars run so hot? The use of such rocket science to improve Ford's EcoBoost engines means owners of the new Ford Fusion and Ford Focus ST can enjoy the spirited though efficient performance of their cars without worrying about burning out the engine. In a further application of advanced technology, the turbocharger has a dual cooling system. The BorgWarner K03 turbocharger developed with input from Ford engineers, utilizes both water and oil cooling to cool the component. The turbo is predominantly cooled by oil when the engine is running, but when turned off, a water cooling system passively draws heat from the components, cooling them down. Another aspect of the advanced engineering of Ford's EcoBoost engines is the fact the Fusion 2.0-liter features an integrated exhaust manifold, combining the cylinder head with the exhaust manifold into a single part. This configuration allows smaller internal passageways directing exhaust gas into the turbo more effectively than separate components. The combination of rocket science, superalloys and automotive engineering in this new turbocharger means it can operate at speeds up to 190,000 rpms. It's enough to make even a rocket scientist dizzy. • The Ford Fusion has a listed maximum thrust of 240 horsepower, compared to 252 hp in the Ford Focus ST. The Space Shuttle has a maximum thrust of 419,000 lbs or about 9.5 million hp. • The two Ford models get an estimated 23 to 33 mpg. The Shuttle consumes 350 gallons of rocket fuel per second. • On a full tank, the 2.0-liter EcoBoost can run for 467 minutes, or nearly eight hours. A full fuel tank on the Shuttle lasts you 8.5 minutes. • In the Ford models you have a top speed of 135 mph, while in the rocket ship you achieve orbital speed of 17,500 mph. • Finally, in the Space Shuttle you could go around the world in about 90 minutes. With the Ford 2.0-liter EcoBoost engine, Ford has somehow computed it would take 355.7 hours. The automobile might be slower, but the scenery would be a lot more distinguishable. Eureka! Put some fins and a gravity toilet in the Escape EcoBoost and BAM! The next space shuttle! NASA is saved!